How to turn off annoying invitations on Facebook? Yes, unlike some privacy freaks, I do have a Facebook account. And yes, I like to check out my Facebook from time to time and have it on my phone so that I can see the latest status update from my friends. However, it becomes really annoying when I am constantly getting notifications about someone invited me to play a particular game or take a particular test. And this is without the knowledge for most of your friends since they were just offered to connect their games to Facebook for x extra bonus points or goodies or connect to Facebook to get the results of some tests, without knowing what, by “connect”, means. So how can one disable those annoying notifications? Well, the easiest way is obviously to remove your friend from Facebook, but it is not necessarily the best approach since as what I have mentioned above, the “inviter” may not really know he/she was sending you the messages. Therefore, a slightly more complicated way is to block the invitations on a particular app, and here is how you do it. 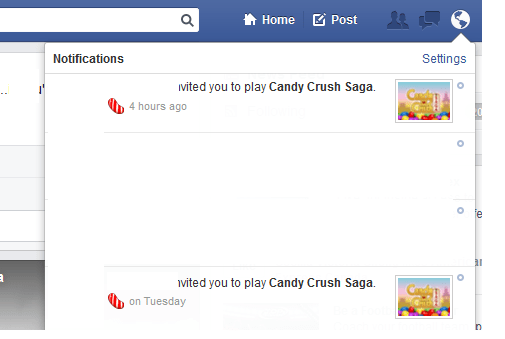 I will use Candy Crush Saga as an example since it is one of the games that I receive a lot of notifications on. And you can start turning off the notifications one by one. I have not found a way to mass turn-off all the notifications for all apps, if you do, feel free to share.